August 18th 2016 marks the one hundredth anniversary of the death of Captain Richard Conway-Lowe MC at Pozieres. Richard was my grandfather's cousin and I couldn't let this significant date in the family's annals go unmarked. What follows is a repost of a blog I did some time ago about my search for Richard and the deeply moving effect it had on me. Since writing the original post I discovered that among other things at 6' 7" Richard was the tallest man in the British Army. I had the pleasure of dedicating one of the Tower of London poppies in his memory and of hearing his name read out at the evening roll call. My husband, who prefers to keep his cyber identity private so I shall call "D", and I met in the Army Reserve (Officer Training...he lent me a pencil for my navigation exercise...etc. etc.). We both served in the Australian Army for just on twenty years each before a move to Singapore put an end to both our careers. One thing all those years instilled in us was a mutual interest in military history. Dâs grandfather fought with the Australian Army in World War One. He had been in the second wave at Gallipoli and the family had always assumed he had sustained his wound there. Until D started researching his grandfatherâs history, no one knew he had served in France. He would talk about Gallipoli but never the Western Front and it was on the Western Front, in the bitter fighting on the Somme he had been wounded in the left arm. My own grandfather (on my mother's side) was a medic in the British Army and served, as far as we know, for most of the war in the Middle East. He joined up after his eldest brother had been killed near Basrah in modern Iraq. Many people may think the medics had a cushy job but quite often they put their own lives on the line to rescue the wounded and transport them back to the casualty clearing stations. Mercifully he survived unscathed but his experience may explain why he never settled to normal life in Yorkshire and accepted a posting in the civil service in Kenya (Colonial East Africa), taking his new bride with him, a young lass who had never even been to London. In 2005, D and I finally achieved a long held ambition to visit the Battlefields of World War One. We began in Ypres in Belgium, that beautiful medieval cloth town so comprehensively destroyed in the war. Together we walked the city walls finding little war cemeteries along the way and joined the solemn crowds at the Menin Gate for the service of commemoration which is held every night. 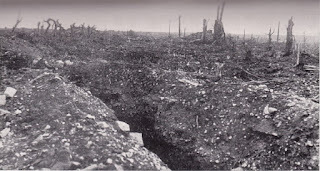 We hired a car and with a map in hand we drove out into the Ypres Salient. The flat Belgian countryside bears little resemblance to the nightmare pictures we had seen in the Museum in Ypres but among the green fields, there are countless cemeteries, with the white crosses in orderly lines looking, as I described it in Gather the Bones, like a âharvest of deathâ. From Belgium we drove down to France and Amiens. It is hard to imagine the horror that 1914-1918 visited on the soft green fields of the Picardy countryside. The little villages have been rebuilt and farmers tend the fields just as they always did but the grand war memorials and scattered cemeteries once again bear the testament of those who died here. 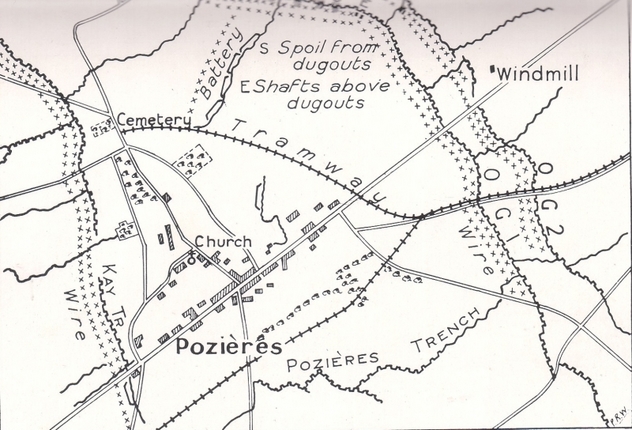 It was one of many tiny little villages on the road to Amiens that brought together both D's grandfather and my search for a missing relative - Pozieres. It was here, at the battle for Pozieres, that Dâs grandfather had been shot in the arm, an injury which would trouble him for the whole of his life and it was here in the British cemetery that I fulfilled a promise made to my father ... to find the grave of his own fatherâs cousin, Captain Richard Conway Lowe MC. The War Graves Commission makes it an easy task to locate the one tombstone among the many and I had little trouble in finding it in the British Cemetery. What I hadnât been prepared for was the wave of emotion that surged through me as I stood looking down at the simple white grave stone. 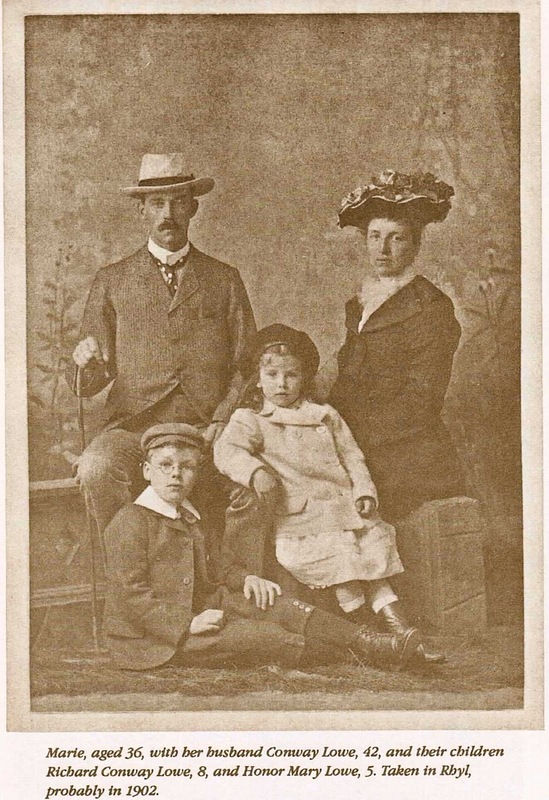 All I knew about Richard Conway Lowe had been gleaned from a few family photographs of a rather solemn little boy with fair hair and glasses. Family history recounts he had been a good student at Winchester and Oxford and had been destined to go into the Church. I also knew he was 6â 7â. He came from a respectable middle class family in Edgbaston near Birmingham and on the outbreak of war, he joined one of the local Warwickshire volunteer regiments. I didnât know he was only 22 years old when he died. He was the same age as my eldest son. As I laid the little poppy I had bought with me, I touched the gravestone and thought how many, many years it had been since anyone grieved at this graveside. The entire family line had effectively died out with this boy. I sat on the grass beside his headstone and the tears welled up. "Second Lieutenant Richard Conway Lowe., 1st/6th Battalion, The Royal Warwickshire Regiment, Territorial Force. 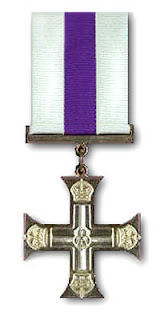 For conspicuous gallantry on 4th November, 1915, in France. When directing a working party in front of the parapet, the Germans opened fire and wounded a man of the covering party. Second Lieutenant Lowe and a Serjeant rushed to his aid, and although the Serjeant was grazed by a bullet and Second Lieutenant Lowe shot in the thigh, the bullet being subsequently found in the wound, they carried the wounded man across the open and through the wire into a place of safety. He received his medal personally at Buckingham Palace in January 1916 while home recovering from his wound. He was killed in action on August 18, 1916. 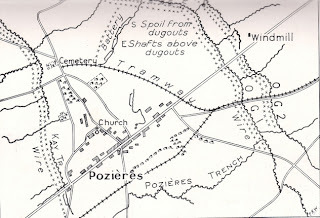 The Germans had been in occupation of Pozieres since 1914 and in July 1916 the allies commenced one of the bloodiest battles on the Western Front...the recapture of Pozieres and to secure the high ground behind it. When I looked to see what action had taken place on that day, "British advance from Pozieres to Somme; ground gained towards Ginchy and Guillemont." Just another day on the Western Front. After his death his mother, Marie Lowe, worked tirelessly in organising women volunteers for the provision of laundry services to the hospitals in Birmingham coping with the needs of the wounded. By Dec 1917 over 4000 articles a week passed through the hands of the 70 VAD volunteers and 8 paid laundresses. The family history relates that his father, Conway, "never really recovered from the death of his elder son". He fell out with his business partners and "These two blows left Conway a broken man, and Marie had to become the decision maker and mainstay of the family." These few days spent in the company of the dead from a bloody war provided part of the inspiration for my new book, GATHER THE BONES. The following is a short extract, drawing on my own experience... "...Helen stared out of the foggy car window as the countryside changed from pleasant fields and hamlets to an unrecognizable landscape of ruined villages, barely passable roads, devastated forests of tree stumps and a bleak landscape of churned fields. If she could have imagined the end of the world this is what it would have been like. Many of the villages through which they passed had been completely destroyed leaving nothing more than piles of rubble where there had once been a bustling little town with bakers, butchers, churches and homes. Some new buildings had begun to rise from the ruins, but the deeper they drove into the Ypres Salient, the more dismal the landscape became. What had once been fields were now nothing more than wild earthworks from a painting of hell, dotted with small cemeteries of rows of white crosses, like a grim harvest of death..." For more about the First World War and the inspiration for Gather the Bones, see my post on "A Michelin Guide to a Story Idea" first published on Historical Hearts.